The alarm went off at 4:30 am. I was tired. I got up but then decided that I would not go running after all, plus there’s a bit a cold that might be coming on, a gift from my wife :). I laid there hinging between dreaming and wakefulness. My mind was very lucid and I was choosing to dream because I wanted to go back to sleep. It was a choice, as it were. I saw two very small figures, like 6 to 10 inches tall, who were grayish (not alien grayish) and a TV appeared. I had decided that I wanted to dream and that would be to choose to watch the TV. The figures then spoke to me in a very endearing voice of solidarity. Weirdly, they spoke to me with a funny “cowboy or hard Texan” accent. One of them said, “Well, if you want to watch TV, that’s cool, we’ll do it with you if that’s okay.” They were very sweet and I felt that they were with me in whatever I chose. But as I said before, I was also lucid. So I said with a grin, “Hey, wait a minute. Who are you?” Then they “zipped” off the grayish black color and revealed themselves to beings of white light…. Angels. They were part of the guardian forces around me and they accompany me and are in solidarity with me in whatever I choose in my freewill. It was as if I had caught them in action where higher dimensional beings are able to shift themselves into our subconscious. It’s like they put on clothes that are available in our unconscious worlds and then blend in. That encounter brought me out of wanting to sleep so I got up and made coffee, did Centering Prayer, and went for what turned out to be a 14 mile run. I decided not to listen to anything on the headphones for the first few miles to see what might happen. After about a quarter mile, I prayed for protection and surrounded certain people in my life with white light, including myself. Then I was asked, “What do you want?” I responded, “I wish to see the Temple of the Heart.” I then dropped down as if on a cloud and “landed” on the courtyard in front of the Temple. It was the Temple as I saw the Cross of Light. Then the idea of wanting to see Daskalos entered my mind. I made the visual of Daskalos and then I saw him behind me. He was as I have seen him in pictures but he was younger and a golden white hue surrounded him, an aura. I asked him to bless me. He put his hands on my head and asked me what I wanted. I said that I wished to learn how to love better. He then pointed. I thought that he was pointing to my Temple and I started to walk that way. He responded, “No. That way.” I followed his pointing (his right hand) and he was pointing in the opposite direction of Temple. I followed his gaze and saw a huge diamond crystal. (Note: when I was retelling the story into my phone so that I would capture the details of the vision, I looked down at the exact moment when I was mentioning the diamond crystal and I saw a diamond shape on the concrete below my feet. See top picture) It was similar to the diamond that can be found on the Researchers of Truth.net website. It is also similar to the diamond that I saw in a dream two years ago near the beginning of my awakening. If I were to measure it I’d say that it was about 15 feet tall. I touched it and it was solid yet I knew that I could enter it by simply desiring it. There was an electrical quality to it; not in the sense of it shocking me bu t a energetic tingling was felt. It asked it, “What/who are you?” A voice/thought responded, “I am the energy of your Higher Self.” “I desire to enter you,” I said. “If you do, you will be forever changed. Do you want this?” “Yes,” I said, as I entered it. It was like coming out of the heat of hot Texas day and into a cool room where AC is blowing. It was like taking off a heavy jacket and then jumping into a shower and then emerging totally dry and clean instantly. I was lighter and more expansive. Once inside, I was asked, “What do you want?” I responded, “I wish to see Jesus and walk with him as he was when he walked the earth.” I immediately was floating over desert-like terrain with scraggly plants and whitish cream colored soil and rocks. I saw in the distance several men sitting down together sharing a meal and talking out in the open. I floated over to them and they were laughing and teasing each other and just hanging out. I saw Jesus. (Note: At this moment in my running, I looked up and saw a sign that had “3333” on it. I had never noticed this sign before). He was wearing brown tunic with a red colored clothing underneath. It was not hot so it must have been in the fall, winter, or spring and they were enjoying the sun. His eyes were greenish gray and he had reddish auburn hair. He looked at me and smiled. The others could not see me. I asked him to follow me into the diamond which was kind of like a ship or portal which waited patiently behind us. He bi-located and part of him remained with the men and part of him that was invisible to them came with me. We entered the Diamond and I saw him transformed. 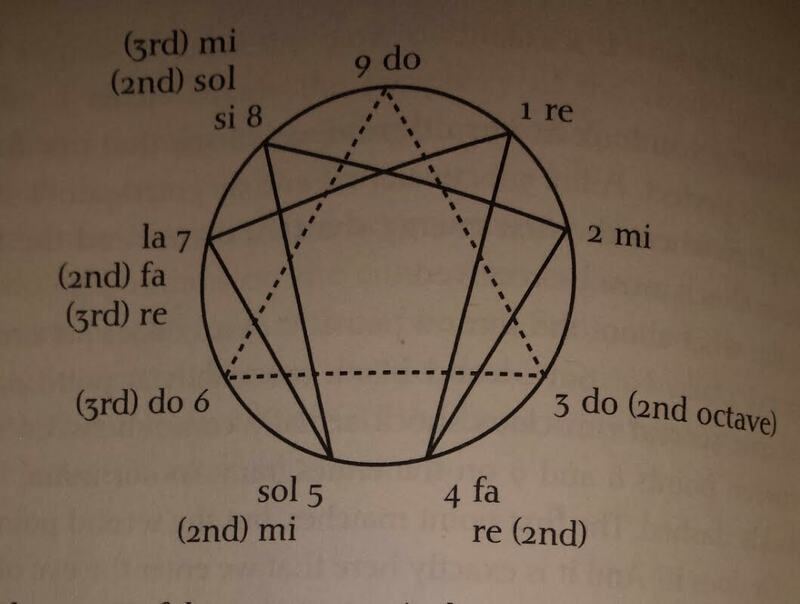 Ra states that Jesus, the man, is now a 5th Density being and I was trying to understand with my little 3rd Density brain how this all can work. I’m not sure I received an answer but I did get some surprises. I allowed my mind to open to the fact that maybe Jesus is now a 5th D being or maybe he is not. What came to resolution in my brain was something along the lines of this: Jesus said, “I am in 5th Density and the metaphysical color for this is the silver that you see. I am also connected to all densities and I am located in very heart of the Logos.” I then saw a metaphorical vision that showed Jesus as a silver energetic being that was connected by a tether or umbilical cord to the “mother” which was the pure golden consciousness that showed itself as an amorphous golden cloud. Jesus was the Christ as he was totally connected to Christ Conscousness and yet he was his own individual. He then moved back into heart of this golden “cloud” and allowed his silver energy to merge with everything else and give a silvery sheen to the golden energy cloud. “I AM one and two.” (Note: As I had this vision, I looked up from my running and saw a car who was turning a corner with the number “333” on the lic plate). Then I thought/asked, “If this is you, then where is the Buddha?” Jesus looked up. I did, too. There was green streaks of energy moving upwards and then tailing off into indigo blue and finally, deep violet. At the very top layers was white light from the Galactic center. I asked, Jesus, “So the Buddha is higher than you?” Jesus said, “No. We are part of one Body. The Buddha has his role and I have mine but we are the same in our Body. We are different members of the Same Body. Then it occurred to me to look down. What I saw put some things into perspective a bit. I saw green streaks of energy that then faded into yellow, orange, and then red at the bottom. At the end of the red, where the “feet” of this Body lay was the Earth. I then understood where I was in relation to the Body. I was in the very heart of the Body. Here, the Cosmic Heart Energy is Christ energy, golden in color, but it also manifests the typical green color of the Cosmic chakra that also radiates from the Golden Center. Beings were then coming out of the Heart, they were Angelics of the highest orders. Then something even more surprising happened. I saw/felt/knew/intuited that the entire body was not a Body at all but somehow a three dimensional torus shape like a giant donut. The Heart was the center point where the whole energy was coming through from back to front and outwards. 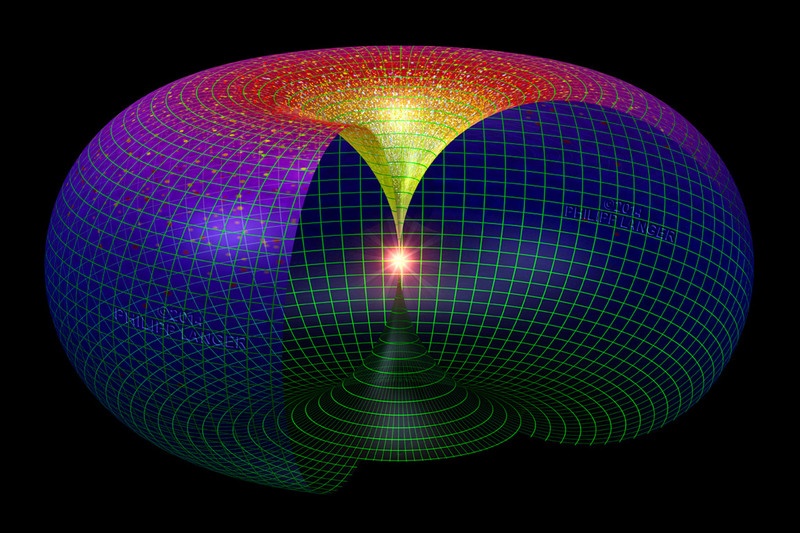 The Galactic Logos Itself was part of this whole movement of the flow of the Torus and that all of the galaxies, in fact where part of this toric flow. I seemed to be seeing the Universal Logos at play, the Creator of the Creators, as it were. The very Heart of the Universal Creator was the metaphysical center point where Christ Consciousness ever flows outward. An yet another surprised awaited me. The burgeoning outward flow took on geometric shape. It was a giant pyramid, four faces of three sided triangles birthing forth in a corkscrew manner. With my waking eyes, I was “told to look up” and I immediately saw a giant roof on a house that was a four-sided pyramid. Confirmation. Then I saw that was coming out was the head of a cosmic golden merkabah whose rotation was 34 to the left and 21 to the right for the bottom pyramid. 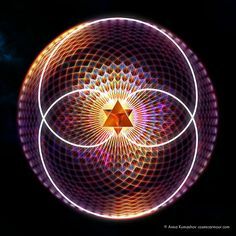 All the manifested Universe was caught up into the giant sweep and flow of the Cosmic Torus whose very heart was Christ and whose shape was a merkabah. This was Christogenesis, as Ilia Delio, OSF, writes. Furthermore, I intuited that the number 34 was important as it the sacred number in which Christogenesis occurs. I do not know all of the reasons yet, but a couple of them might be because the Creator as Relative Beingness grows and evolves following the Law of Three. When there is Force Affirming, Force Denying, Force Reconciling, then there is always a new Fourth that is created. The arising Fourth (4) then becomes the new Force Affirming which necessitates an agitation and thus a new Force Denying counteracts. The Holy Spirit always acts as the Force Reconciling. This Cosmic musical overlay happens always and forever, building louder and more beautiful symphonies of perfection as the Creator plays Itself outwardly for all eternity. Now… I am very prone to self doubt and will often begin to doubt my experiences even if I just had them. Moreover, when I am not in the trance state or after a night’s sleep from an experience, I can often come close to dismissing the whole thing that happened as pure fantasy, imagination, or delusion. I don’t know how not to do this. With this in mind, I had just finished relaying my info via the voice recorder on my phone (while I was still running) and I had begun to doubt my experience. 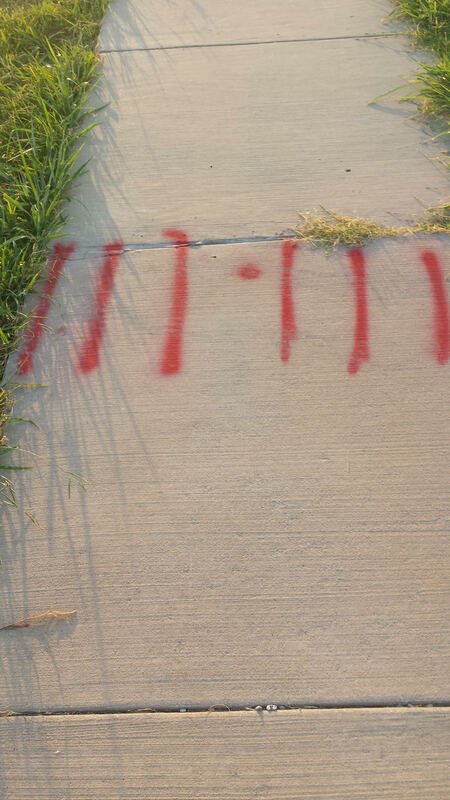 Just then I looked down and saw “111.111” on the sidewalk. I realize that this was put there by construction workers and probably isn’t meant to be one’s but since this work graffiti wasn’t there anywhere else on the journey, I took it as synchronistic.